A MUST SEE! This home is in move-in condition in a popular, well established neighborhood. 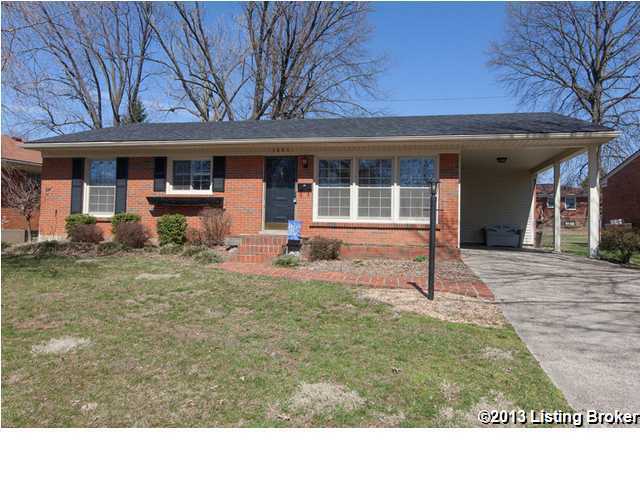 This 3 bedroom, 2 bath ranch has been extremely well maintained and updated. The master bedroom has a private bath, with an additional full updated bath on the first floor. The kitchen has been completely remodeled with cherry cabinets, neutral paint, new countertops, flooring, plus a breakfast bar. Beautiful hardwood floors throughout. Fenced-in backyard, large patio and carport are additional features. The finished basement has an additional room that could serve as an office/spare bedroom. This home is conveniently located in Hikes Point and close to shopping, school, churches, bus line and more. All appliances remain. Midlane Park is a subdivision within the city of Louisville, Kentucky. There are currently 1 Homes for Sale within Midlane Park, with asking prices ranging from $215,500 to $215,500. The average list price per square foot of the available inventory in Midlane Park is $112, which is below the Louisville average of $155. The Average Sales price of all sold real estate in this subdivision for the past year is $183,520. Recent comparable homes have been selling for 98.01% of their asking price. Waterfront homes represent 0.00% of the available Midlane Park inventory. The population of Louisville, according to the 2010 Census, is 597,337. The total number of households in the zip code of Midlane Park is 13,533, with an average household size for of 2.30 people. The total number of renter households within the zip code of 40218 is 6,472, which means that 52.18% of households in this zipcode are owner occupant households. 3805 Chatham Rd, Louisville KY 40218 is a Home, with 3 bedrooms which is recently sold, it has 1,869 sqft, 0 sized lot, and 1 Car Carport,Driveway parking. A comparable Home, has 4 bedrooms and 2.5 baths, it was built in and is located at 2913 Sheldon Rd Louisville KY 40218 and for sale by its owner at $ 215,500. This home is located in the city of Louisville , in zip code 40218, this Jefferson County Home, it is in the MIDLANE PARK Subdivision, and RANGELAND are nearby neighborhoods.